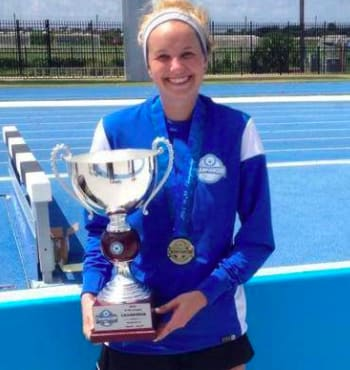 Kelly, a college soccer player, lost 10 pounds, 7.1% body fat (14 pounds of fat), and 7.5 inches in just 11 weeks. Amy lost 17 pounds, 3% body fat, and 13 inches. 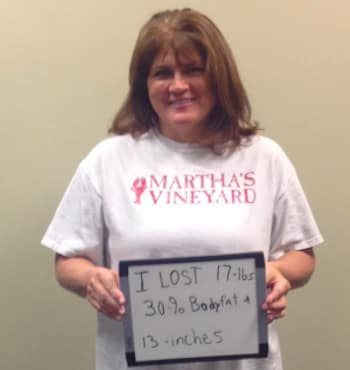 Sherry has lost 8 pounds of fat, 3% body fat and 7 inches. 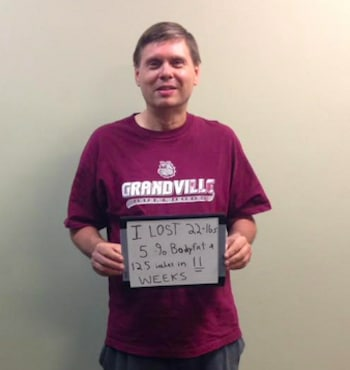 Ken lost 22 pounds, 5% body fat, and 12.5 inches in just 11 weeks. In 12 weeks Lisa lost 2% body fat, 5.5 inches, and gained 10% of lean muscle and strength. In only 5 Weeks Annmarie lost 2.5% body fat, 4.5 lbs of fat, and 7 inches. 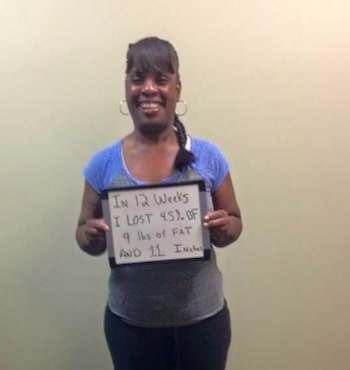 In only 12 weeks Tina lost 4.5% body fat, 9 lbs of fat, and 11 inches. 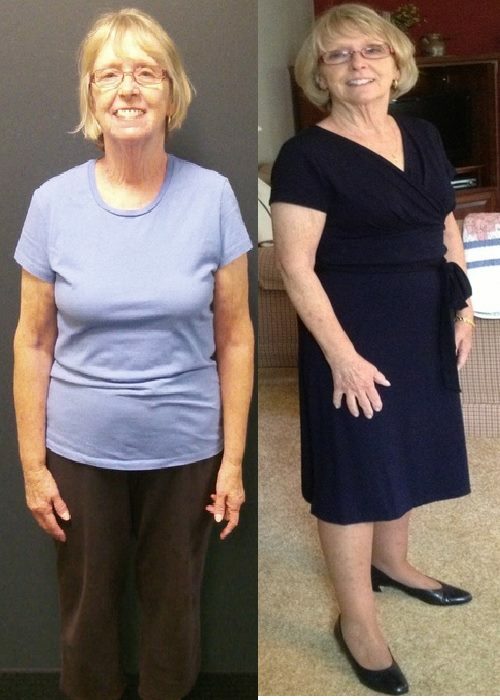 Susan lost 13.5 pounds, 4.5% body fat, and 14 inches! 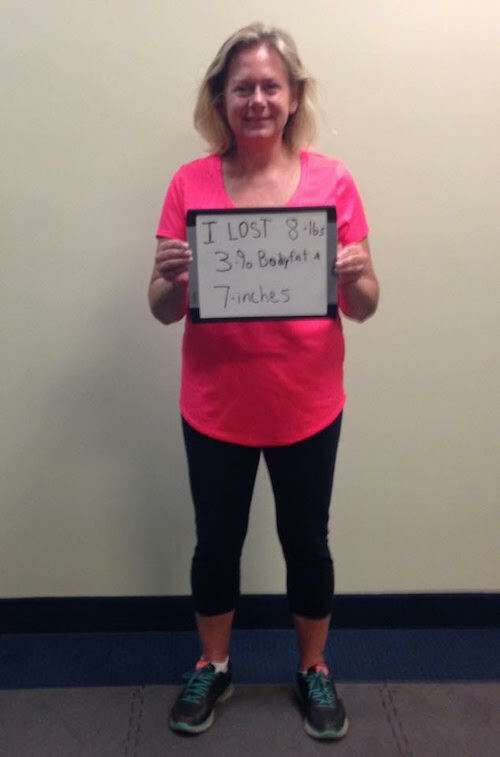 Sandi lost 17 pounds, 6% body fat, and 12.5 inches in 10 Weeks! I am so thrilled with my 6 weeks in David’s Real Results Program! Attainable results were achieved in a low pressure environment with simple nutritional changes and efficient weight training workouts. No painful soreness, no fishbowl gym, and actual real results in a short period of time! 6” lost and down 3.1% body fat in 6 weeks was awesome! Learning the balance of food and fuel was really key as well as recovery rest. Seeing what I could accomplish in 3 sessions per week with quality versus quantity was eye opening! Thank you for teaching me your way and how it works for me! 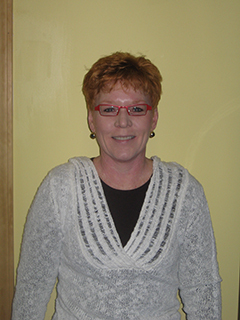 Julie lost 9 pounds, 3.2% body fat and 9.5 inches. 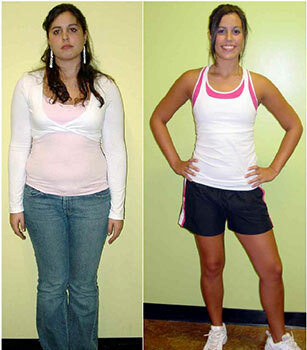 Jacqueline lost 20 pounds, 5.5% body fat, and 15 inches in only 12 Weeks. Wow! Truly the most knowledgeable coach I have ever met. Before working with David at Real Results Fitness I was frustrated and unhappy with my results. I was spending all my workout time running, taking fitness classes in town. I was doing everything from yoga, barre, spin, boot camp and body pump and eating very low calories. I was seeing zero results and was often tired and injured. David educated me on how to train and eat smarter and not harder. 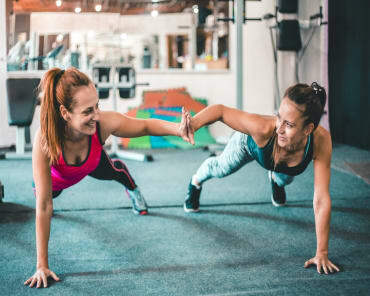 With his guidance I realized I was not getting the healthy balanced lifestyle down, and I was punishing my body with not getting enough quality food and rest, and I started to hate exercise. With his friendly and encouraging support, motivation, and direction I was able to break out of my funk and start to love my body again and in process see fantastic results. In 12 weeks I lost 18 pounds of fat, 6.5% body fat, and 13 inches on his program. If you are looking for and effective, fun, and non-intimidating coach and program in Rockford that works then you do not need to look anywhere else! David structures the fitness and nutrition plan to you. He makes me feel comfortable, encourages me to work hard and focus on how I feel, not just the numbers. I recommend him to ANYONE who is looking to lose weight, increase strength or become healthier overall. Working out with David was the best investment I have made in myself. I was always active but lost myself after having my first child. After starting with David he quickly motivated me in a fun atmosphere. The workouts were customized to my needs and I always felt he offered the right amount of encouragement and distraction. I loved that I could trust that he knew what my body needed- I never had to think about what I was doing but always left knowing I got a great workout in. It truly made me value my health again and I had fun doing it! Overall I lost 2.5% body fat, 7 inches, and my husband told me I was the most tone he had ever seen me! I highly recommend working out with real results fitness if you’re sick of a one size fits all approach and want to invest in yourself again! 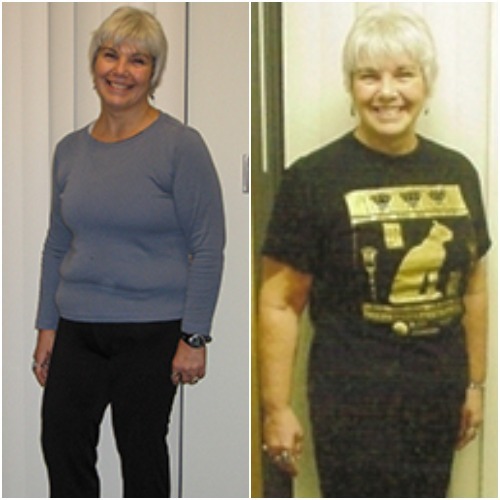 I feel compelled to share my great experience again with Dave and his Real Results program. In 8 weeks I lost 12.5 pounds, 3% body fat and lost 13 inches. Not only does Dave know how to structure his workouts to get the best results, his nutrition coaching in conjunction with the workouts, is life changing. 10 years ago I worked out with Dave and had great results also. I would not go to anyone else. He's the best of the best. Thanks for making life better Dave!! 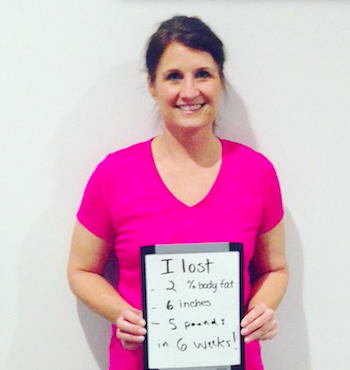 In only 12 weeks Tina lost 15 pounds of fat, 5.5% body fat, 12 inches, and 6 dress sizes! I am extremely happy with the results I received by signing up and working with David Modderman. He has taught me so much about weight training and eating healthy, unlike the personal trainer I had in the past. I didn't get the great results with her either! I want to thank David for the health tips, food journal, great workouts, recipes and just plain helping me reach my health and fitness goals! I will recommend you to all of my friends, family, coworkers etc., God bless you and your business! Thanks again!! Professional, knowledgeable, encouraging and a clever sense of humor...these qualities of David Modderman made it a joy to work with him these past 12 weeks! As a result, I was able to lose 13 lbs, 4.5% body fat, and 12.5 inches. I appreciated his "eating clean" philosophy and his holistic approach to heath overall. He definitely "talks the talk and walks the walk", which is an inspiration to all who work with him. I strongly recommend his fitness and nutrition coaching to anyone who is ready to make the commitment to improve their health! 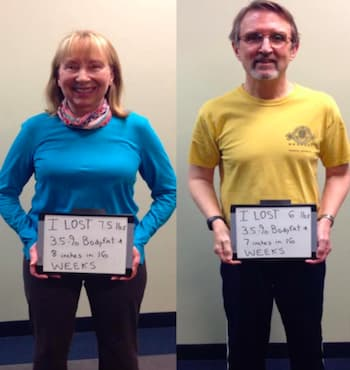 David's Real Results fitness program is just as the name implies. No hype, no nonsense. He shows you how you can get better results with refined technique than you can with fancy equipment. He also provides nutrition advice and recipes which had the biggest impact on me getting fit and healthy! I reached closer to my fitness goals at Real Results in 12 weeks than I did actively going to the gym for over a year. I lost 3% body fat and a combined 8.5 inches (5 inches around the waist)! The fitness, nutrition, and coaching expertise I received from David over the past few months has led to major improvements in my fitness and overall health. I appreciate how David listened to my goals & objectives and tailored a program to deliver results. A few weeks into my program, I encountered a medical issue which greatly diminished my ability to exercise effectively. 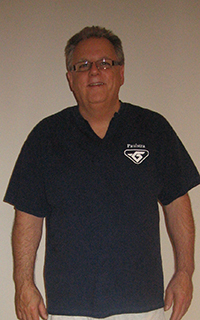 David modified my program, and despite the medical challenge, I lost 21lbs and 12.5 inches in 12 short weeks. Partnering with David has led to a much improved quality of life and well-being. I appreciate that he places just as much emphasis on nutrition and “rest” as he does on exercise. Working with David is what I needed to stay accountable to my health. The principles and values he emphasizes, when utilized consistently, lead to a lifetime of well-being. Thank you so much for all your help with your personal training and nutrition coaching! I feel so much better and once again love my body. I have my self confidence back! You have given me the tools to keep this lifestyle up easily. I've become a healthier person without even realizing it. Since we started together I have lost 10 pounds not just on the scale but 5.6% body fat and 11 pounds of fat! Diets were never my thing. Id go on one, get hungry and give up, pig out, and then gain more weight than I lost. It was hard to get motivated while my skinny friends could eat whatever they wanted and not gain a pound. Nevertheless, I knew I had gained so much weight over a year that I had to keep trying. When I first started Metabolism Makeover I was reluctant, because I loved my sweets and Fazoli's was almost an every day thing. 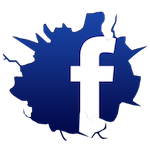 However, I was relieved to find out that I could create menus according to what I liked (minus the processed and junk food) and I would get to eat six meals a day. 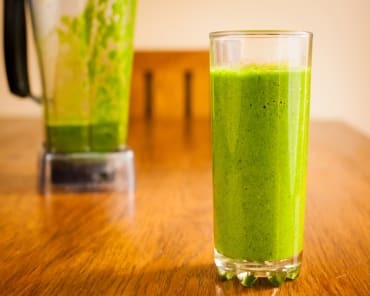 I liked the healthy food I was eating and I felt good about myself after I ate it.>Doubt surfaced again when I wasn't losing as much weight as I thought I would. I thought that all diets are supposed to work fast. Then, my fitness coach reminded me that this wasn't a diet I was on, it was a lifestyle... a permanent change. The difference is that after the Metabolism Makeover, I'll keep the weight off and keep it off by making helping choices (opposed to starving myself). There's no healthy short cut to losing weight. After my metabolism and my body adjusted to the drastic change, the pounds and inches melted off. My self-confidence progressed and that forced me to keep going. 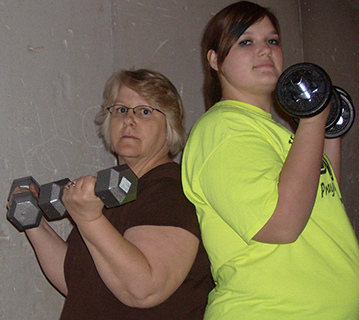 I'm not sure I could have ever pushed myself to the extent that I did without the help of my Fitness Professional. Twenty-five pounds lighter.... I feel thinner, happier, and healthier. With the exception of a few Hershey kisses now and then I don't even miss my old eating habits. I'd take Triscuits over Pringles any day. In August of 2005, I underwent major surgery and for the following 4 months, I did not exercise and my dietary choices were terrible. I had gained over 15 pounds, I was tired, and most of clothes didn't fit. I was sick about it. With my wedding only four months away, I knew I needed to take real action. 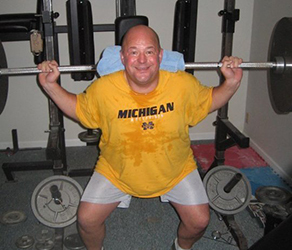 That's when I got connected with Grand Rapids Personal Trainer David Modderman. When we met for the first time in January of 2006, I told David that not only did I want to get into great shape for my wedding, but I also wanted to learn better diet and exercise habits for life. I was tired of the "up and down" game that I had played for so many years. David told me I had come to the right place. And he was right. Over the next four months, David educated me on the importance of healthy eating and not only told me what I should and shouldn't be eating, but he also explained why. That was probably the most important component - the time he took to help me understand the fundamentals of good eating. The other important component of David's fitness program is exercise. Focusing first on building core strength, David then moved me into muscle development and fat burning through resistance training. I was amazed each week to see myself getting stronger. I have learned that just jumping on the treadmill is not enough. It's important to add some sort of muscle building component to my exercise routine. I am grateful to David for teaching me how to live a healthier life through diet and fitness. I lost 20 pounds of fat!! The added bonus was that I felt absolutely fantastic on my wedding day. Thank you David! When I first started with David I weighed over 330lbs. Only after his nutrition counseling, and fitness coaching did I learn why results on my own were slow and unpredictable. With the information I gained and David's guidance... I've lost over 100 lbs. and I am continuing to lose weight. Having tried several other personal trainers in Rockford and fad diets with little success I now appreciate the level results that David has helped me achieve. I cannot imagine where I would be without his personal training and nutrition coaching. 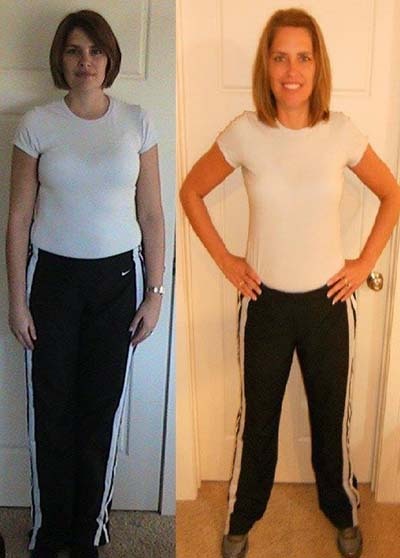 Erin lost 3% Body Fat, 4 1/2 inches in waist and 1 /2 inches in hips. I had finally come to terms with that fact that I had hit a plateau. 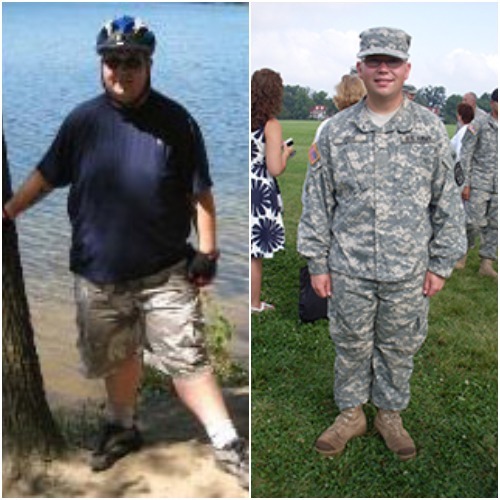 A loss of 70 pounds wasn't all that bad (see my before picture). I was ready to settle and live with the progress I had made up to that point. The tipping point in my life came at the end of May 2004. But let me digress to tell you how I came to this life. I was extremely active and athletic during high school and my first year or two of college. 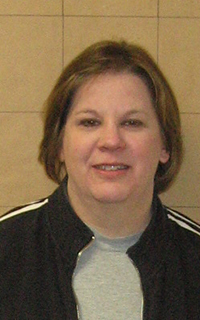 I played tennis and golf and when I got to college I played intra-mural flag football and softball. After I graduated I got my first real job that was extremely stressful. I rarely had time to eat a decent meal so I found myself eating lots of fast food or anything that was quick. During this time I met my husband who can literally eat anything that he wants and never gain a pound. I guess this led me to believe that I could also eat whatever I wanted, but unfortunately I didn't realize that I would gain the pounds for both of us. I became pregnant with my daughter in December 2002 and only gained 11 pounds up to my 8th month of pregnancy. In May 2004, I went for a doctor's appointment. I hadn't been on a scale since I was in the hospital after I delivered my daughter and was I in for the shock of my life. The scale said that I weighed 226 pounds! I was able to lose 6% body fat (8.5 pounds of fat), and 3 inches off my waist in 6 weeks with the help of David Modderman's Personal Training and Nutritional Coaching Services! If your looking for a Personal Trainer in Rockford, MI don't look anywhere else! The 17 weeks of Real Results is one of the best programs that I have ever participated in. 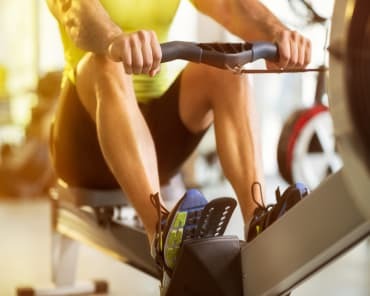 When I started the program, it was hard for me to believe that I didn't need to count points, measure the serving size or go hungry to achieve results; rather I learned that by eating the right foods combined with the right type and amount of exercise I would quickly see and feel the results. Over the course of 17 weeks I lost 2 1/2% body fat, 5 1/4 inches overall, and I feel stronger mentally and physically. While my weight remained the same during the course of the program, my clothes fit better than they ever have. David said that the results may not be seen on the scale and he was right! I am very excited about the change in my eating habits and the elimination of sugar from my diet. The supportive eating concept is one that I understand, believe in, and can live with for the rest of my life - and I believe this is my biggest achievement upon successful completion of the program. Thank you David for your support and confidence in me! Before I started training with David, you could find me in the pool or cardio section of the gym. The 17 week program helped me refocus and redefine my goals. I wanted to be lean, strong and healthy. This program was the jumpstart I needed to achieve these goals. My results include body fat reduction and increases in tone, strength and confidence. To achieve these results, the changes I had to focus on were eating frequently, increasing protein and reducing sugar. In the gym I began to hit the weights more and do a lot less cardio. Body fat decreased, I got stronger and felt great. The big lifestyle changes for me were mostly diet related. Being vegetarian, I have been a little protein deficient in the past. I learned that for me, protein powders and bars were necessary even though I ate higher protein vegetarian foods. Also, eating was not a priority before I worked with David. Going 5 or more hours without food was normal. Now, my body tells me when 3 hours has gone by without nutrition. Believe it or not, I eat more now than before. This program can be beneficial to so many. Working with David has been such a great investment. David is a trainer who not only has great workout knowledge but can help you put together your healthy dietary lifestyle. It’s never too late to get healthy! I lost 16 pounds of fat and 7 inches in 10 weeks! I was able to lose 16 pounds of fat, lose 7 inches and gain 2 pounds of lean muscle in only 10 weeks with the help of David's personal training and weight loss and nutrition program! 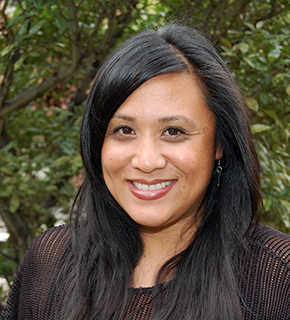 Before I began working with David Modderman I was consuming my days with the stress of being a mother of 3 active children and working as a home care nurse. My life focused on taking care of everyone else, besides me, and my body showed it. I acted confident around others but I truly was very insecure and even avoided many social events with the fear of comparing myself to others and the fear of the people in the room noticing how "big" I was. My life centered around my children and food. I found comfort in the wrong foods and felt exhausted from living a sedentary life. I knew I needed to do something about my weight but felt skeptical at first about calling David. How could I afford a trainer? Do I have the time? Will it be awkward having a male trainer? Has he ever trained someone as out of shape as me? After the assessment with David Modderman it was obvious he had the knowledge I needed to succeed now all I needed was to show up, do my homework and make my financial investment into my health. David didn't expect me to completely change over night. Each week he gave me a new goal. And after each week, and workout, I felt stronger both physically and mentally. Almost immediately I noticed a difference in the way my clothes fit and my measurements were decreasing and I was losing pounds of body fat. The first call I ever made to David Modderman was by far the best choice I could have ever made in changing my life. His training/education was the best investment I could have made for not only my health but the health of my family also. My life has change drastically since David Modderman. Besides the obvious physical changes I now have a drive for life. I enjoy playing outside with my children, shopping for clothes, I have energy, enjoy going out with friends and I'm more confident in my marriage. I can't thank him enough for what he has done to give me the tools to change my life! 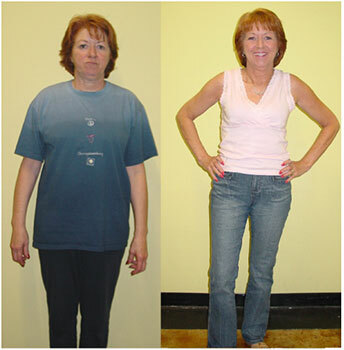 Christine lost 25 pounds, 7.5% fat, and 12.5 inches! Before meeting David and following his program I was a complete couch potato and I did not really pay much attention to what I was eating. I honestly didn’t think I would have the willpower to change my diet and make an effort to exercise everyday. Once I got going on his program my motivation to get healthy and get moving increased a lot. I now really enjoy and look forward to exercise each day! Before I was never hungry and I would miss breakfast everyday. I now am eating breakfast every morning and my energy, mood and metabolism have increased significantly. I have learned how to read food labels properly and I know what to look for and what to avoid. Exercise and eating the right foods have really become a habit for me now. It has been just 8 weeks since I started working with David Modderman. 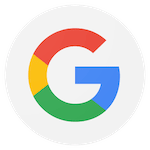 In just 8 weeks I have lost 10 pounds, 5 ½ inches, 2% body fat, and my blood pressure has dropped from 130/82 to 120/73, my blood glucose has dropped 3 points, and my triglycerides went from 277 to 188! 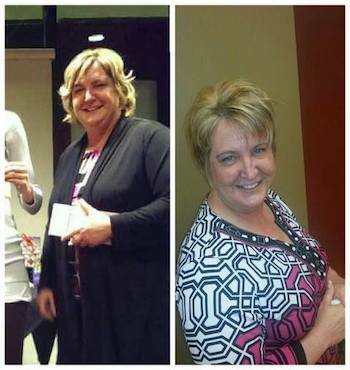 Kris: Since we have started I have lost 42.2 pounds, over 8% body fat, 11 inches off my waist, and 5.5 inches off my hips. 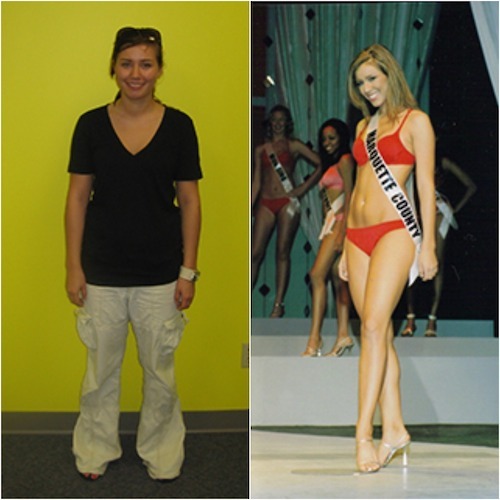 Katie: Since we have started I have lost over 24 pounds, %5 body fat, 5 inches off my waist, and 3 inches off my hips. Thanks David. Couldn't have done it without your help! With Help from David Modderman and his training I was able to lose 52 pounds, 6.5% body fat, and 13 inches. I have struggled with my weight for years beginning with the birth of my first of three boys. 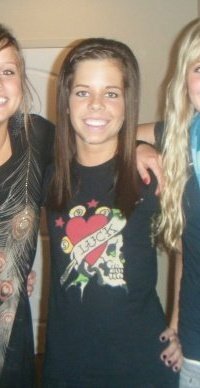 I am 4'11" and have steadily gained weight and then lost it and gained it all back and then some for 17 years. I have tried everything and have even succeeded at several "diet programs". All of the results were short lived - I didn't make it a lifestyle change - and always found a way to cheat the system. Before this program I was eating what I wanted and doing absolutely no exercise. Feeling completely hopeless and just beginning not to care. And then I finally decided I needed to make a change. It was more for me about testing myself -moving outside of my comfort zone. Picking up the phone and calling was the hardest thing to do - but changing my life wasn't going to be easy and I just needed that something to move me to the next level. Since starting David's program I've lost 10 inches, 8.5 pounds of fat, and 3.6% body fat in 12 weeks! Since starting this program I feel better overall. I have more energy. My mood has improved so much. It's crazy but I just feel like I have so much more to give now. More to give to my family and more life to live. I would definitely would recommend David's services. Forcing myself to break through this wall and get out of my comfort zone was huge for me. Combining David's knowledge and step by step plan literally helped me change my life. 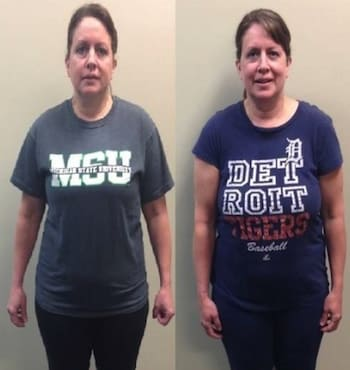 Adriona from Grand Rapids, MI lost 17 pounds, 5.3% body fat, and 6.5 inches in only 8 weeks on the REAL Results program!! 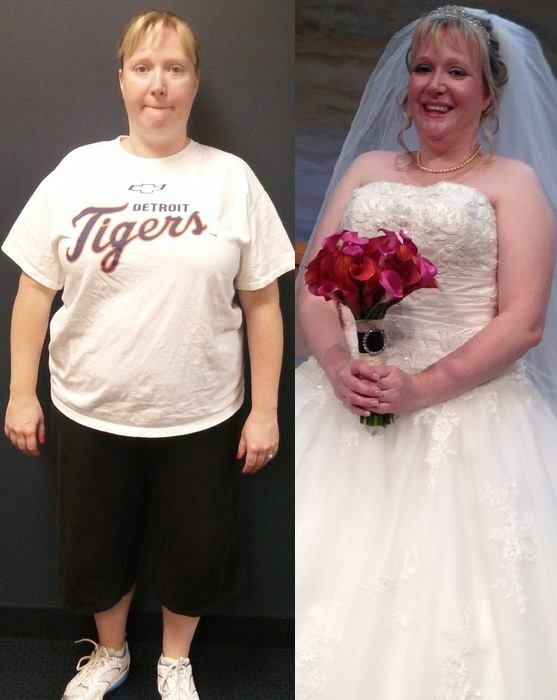 Jennifer for her Wedding Day lost 10 pounds on the scale, 7% body fat (17.2 lbs of FAT) and 13 inches (6.5 off her waist and 2 her hips, and 3.5 off her upper back ) on the REAL Results Program. Wanda lost 10 pounds on the scale, 9% body fat (15.5 pounds of FAT) and 13 inches (6 off her waist and 3 off her hips on the REAL Results Program! 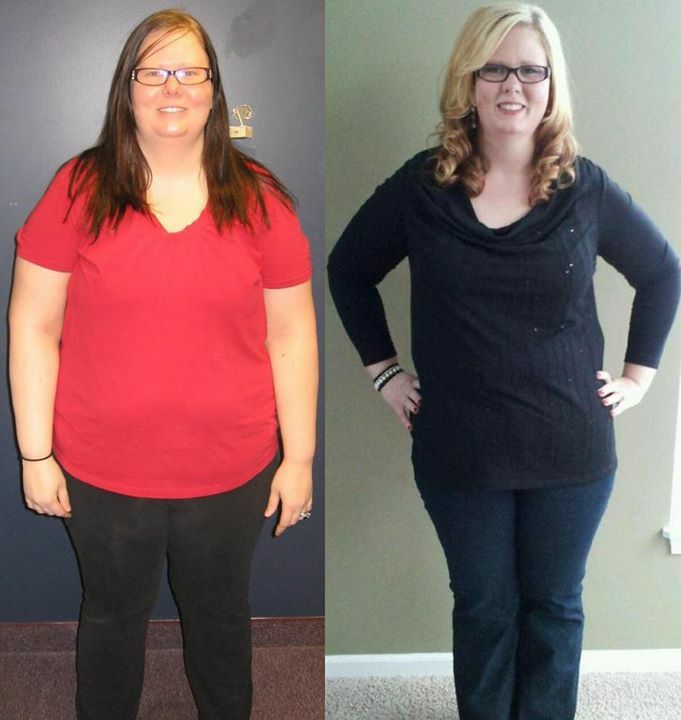 Kristie lost 36 pounds, 5.1% body fat, and 17 inches in 11 weeks. 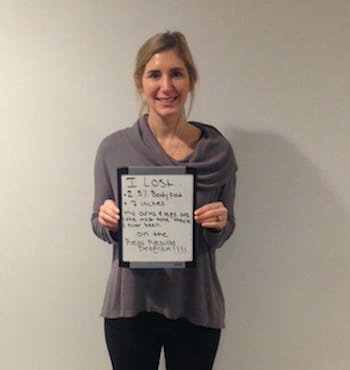 Kaylin lost 8 pounds, 3.5% body fat, and 8.5 inches in 11 weeks! Darius lost 8 pounds, 4% body fat, and 4 inches in 8 weeks! 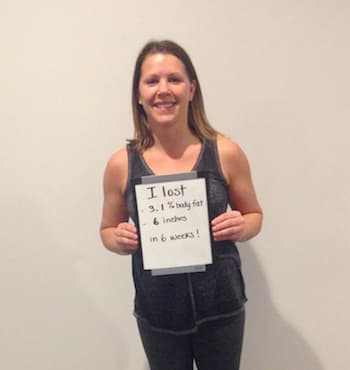 Sarah lost 3% body fat and 6 inches in 8 weeks! 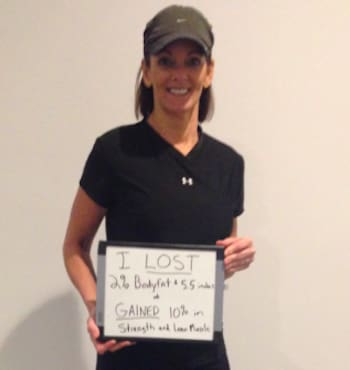 Brenda Risley lost 3% body fat and 3 inches! 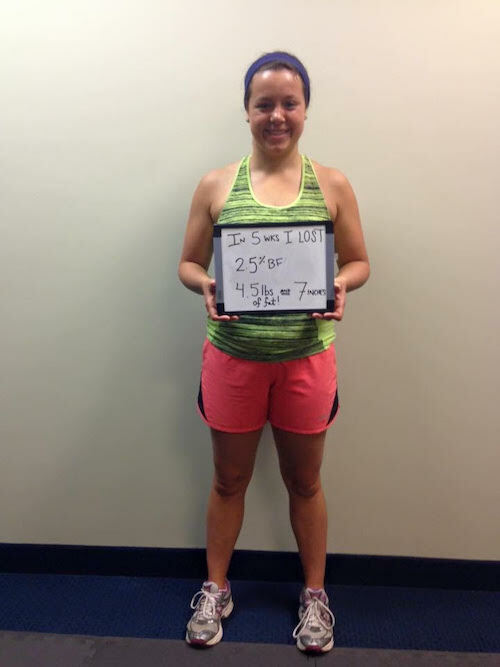 Kate lost 3% body fat and 6 inches in 17 weeks!